Agenda for Change Bay Ward Candidates Forum! 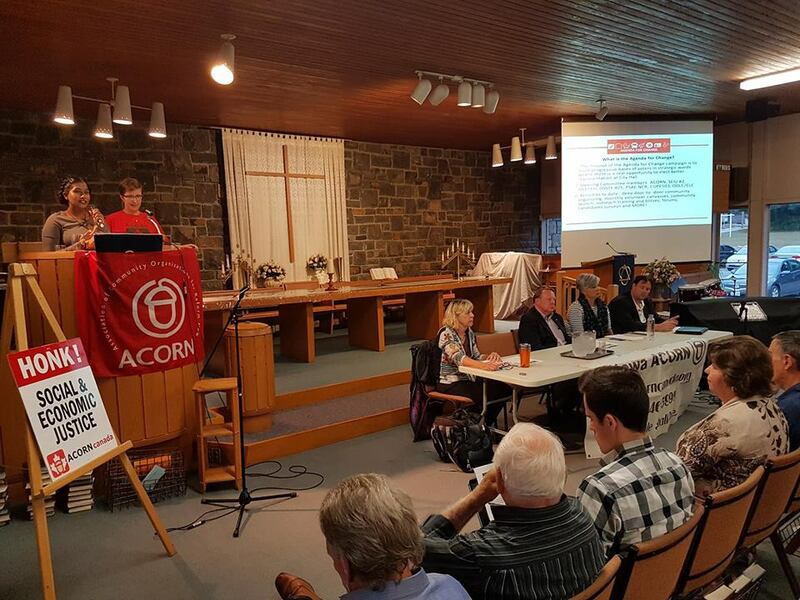 60 ACORN members from Ottawa’s west end participated in ACORN’s Agenda for Change candidates forum on Sept 20th in preparation for the Oct 22nd municipal election. Ottawa ACORN started the Agenda for Change campaign in 2016 as a way to be proactive for the 2018 municipal election. ACORN members are tired of the same old crowd holding power at City Hall, a city council that doesn’t prioritize the needs of its low income constituents but instead caters to the rich and corporate developers. The Agenda for Change is a grassroots coalition between community and our allies in the labour movement. Steering committee members in addition to ACORN include: OCETFO, OSSTF #25, SEIU local 2, CUPE503, PSAC-NCR and CLC/ODLC. Last Thursday’s candidates forum took place in Bay Ward - the ward that during the last election had the smallest political margin of win. The incumbent, Mark Taylor, only won by 3.86% of the vote and is not running for the next term of council. So by building progressive bases of voters in a strategic ward like Bay ward, we really can elect better representation at City Hall! 4 out of the 5 candidates attended last week: Theresa Kavanaugh, Don Dransfield, Erica Dath and Trevor Robinson were all asked to share their responses to the Agenda for Change Platform which included topics like democratic rights, housing, transit, childcare, infrastructure, affordable utilities, employment and zoning. Candidates also took questions from ACORN members, many of which asked for answers on social housing, accessibility, excessive condo development and the need for a living wage. Municipal elections matter. Our members recognize that if we’re ever going to push forward good policy that’s going to better the lives of low income neighbourhoods in our city then we need champions on council. So get informed before heading to the polls on Oct 22nd by reading candidates’ response to our candidate survey. You can read the responses here.